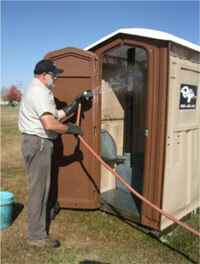 Biffs Pathfinders has introduced a new and revolutionary disinfecting system to service portable restrooms. This is not just a “wash down” using a deodorizer like all the others. This is a safe hospital grade disinfectant that actually destroys bacteria, mold, and other microorganisms. Tim Scarbrough, Service Tech for Biffs, Inc.
Click here to see a video demonstration of the system. We hired an international independent lab to perform tests on traditionally cleaned portable restrooms and restrooms cleaned with Biffs Pathfinders ORIGINAL Disinfectant System. Field tests were performed by a service technician with over 30 years of service experience in the field. Service Technicians, Quality Assurance Managers, and end user CUSTOMERS felt restrooms were cleaner…and they were! Walls and tank appear to have a shine to them. Between services the smell is now neutral. Customers have commented as to why other restroom companies don’t do this.